"Roof of the World, Land of Snows or Shangrila"..........however you describe the Buddhist Kingdom of Tibet it has always held the outsiders fascination. Locked away deep in the mighty Himalayas it offers fabulous monasteries, stunning views of the worlds highest mountains and follows the old pilgrimage route overland from Tibet to Nepal. Nepal Spend 7 days in Nepal seeing all the sights of Kathmandu ( optional Mt Everest Scenic Flight ) before riding to Pokhara ( optional White Water Rafting en route ) and Bidur. Pokhara is renowned for its adventure activities: paragliding, bungee jumping, ultra light flights, zip lines etc. The ride across the "roof of the world" has been listed as one of the world’s greatest rides…….and now that the road from the Nepal border to Lhasa has been completely sealed it makes the ride so much easier and better. Mt Everest Base Camp. It’s now possible to ride to the Mt Everest Base Camp. 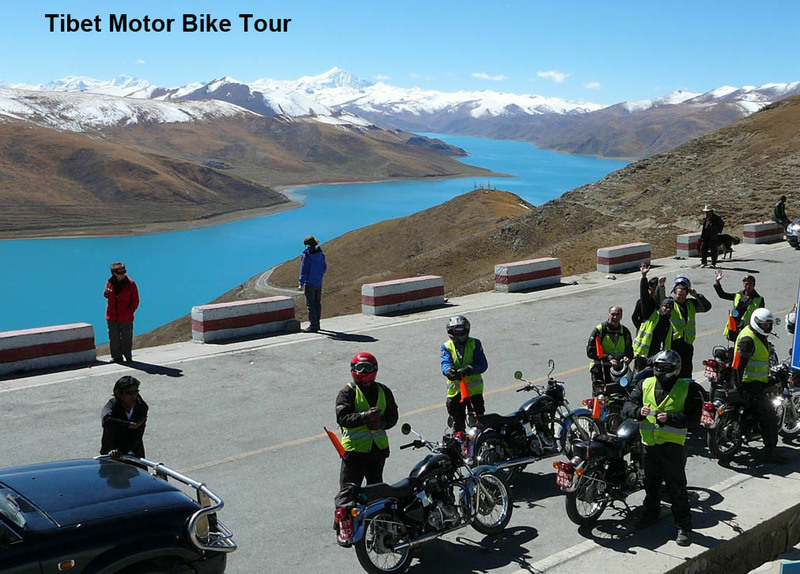 This is a great ride into the high Himalayas and is one of the many highlights of the tour. The road to/from Base Camp has recently been completely sealed. The ride starts and finishes in Kathmandu which provides an opportunity to explore Nepal before or after the tour. Tour Number 1. Ride from Kathmandu to Lhasa and fly from Lhasa to Kathmandu. Tour Number 2. Fly Kathmandu to Lhasa and ride from Lhasa to Kathmandu. En route see monasteries, villages, nomadic tribes, Mt. Everest and experience the starkness, remoteness and beauty of this amazing country and its unique people. Motor Bikes - The motor bikes provided are the Royal Enfield Himalayan. The Enfields were originally produced in Britain. After WW2 the factory was transferred to Chennai ( Madras ) where they are still in production today. An experienced motor bike mechanic will accompany the tour. All fuel, maintenance, servicing and spares are included.